Pinktober: One Week Down, Three To Go. It has been a crazy several months (more on that in another post) and I have wanted to write here on many occasions. But, each time, words seemed to fail me. I’ve really wondered what I could possibly add to the conversation about breast cancer or survivorship given that there are so many amazing voices out there doing it every day. And every time I think I am going to write, I don’t even know where to start. I feel like I have said pretty much what I want to say and don’t really want to become a broken record. Nothing is really new, right? And, I guess that is the problem: nothing is really new. We still have pink washing, breast cancer awareness month and very little of the money raised in the name of a cure going to actual research and . . .
still, 30% of ALL women who are diagnosed with breast cancer will become metastatic – as in having an incurable disease, as in they will die from breast cancer. One week down, three to go. For all of what I love about October (baseball playoffs – especially if my Angels are in it, my empty, beautiful beach, sunsets over Catalina and Halloween) I also dread October. It is pinkified and Komenified for the entire month. Hate that. There is pink everything, everywhere. Turn on the your t.v. and you’ll see it in commercials, the back drop of newscasts, the NFL, you name it, everyone and everything is pink. How is drinking pink alcohol fighting against breast cancer? 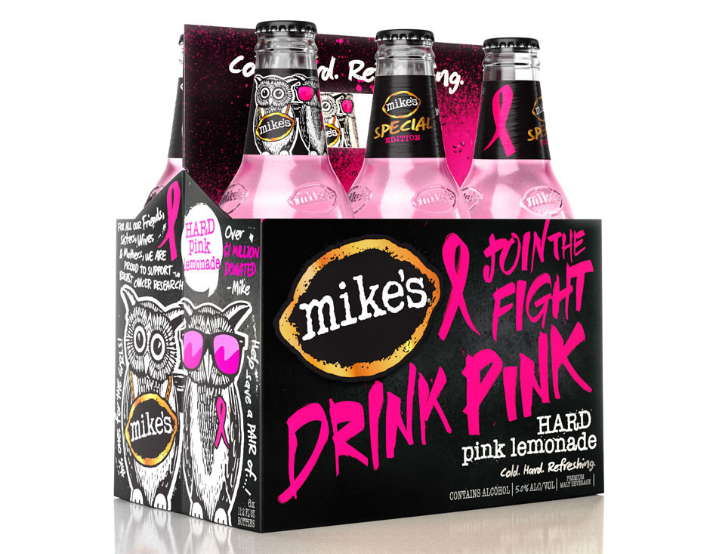 There is ridiculous pink branding and pink washing everywhere (Mike’s hard lemonade usually goes pink along with Campbell’s Soup, and so, so many other companies). Walk into any grocery store, it is as prominent as Halloween, Thanksgiving and Christmas . . . it is like Nancy Brinker started her own damn pink holiday and it lasts a full month long. I realize it is not all Komen, but it seems to be mostly them and if you have read my blog much, well then you know how I feel about Komen. I will never believe that an organization that collected 389 million dollars in the name of a cure (in 2010), but only put 14% of that 389 million towards research, could ever become an organization that I could support or trust. For more on that see: “Komen By The Numbers: 2010 And Still No Answers” and how Komen participated in pinkwashing by pedaling their own pink product, here. 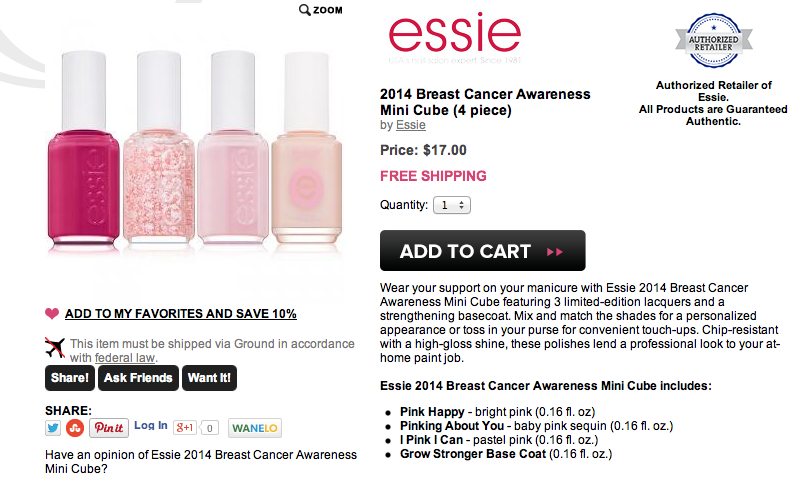 Here is just one of many examples of something that is pink-washed – Essie’s “Breast Cancer Awareness” nail polish – by the way, nail polish usually contains toluene, formaldehyde and dibutyl phthalate (aka: dpa) – all known carcinogens – but who wants to be aware of that . . .
And how about these clever names for breast-cancer-awareness, possibly-cancer-causing-nail-polish: “Pink Happy” and “Pinking About You” and my absolute least favorite: “I Pink I Can” . . . really??!!! In fairness to Essie – since they do not disclose a complete list of their ingredients online – I can’t be sure if they use the “toxic three” in their nail polish. But, most nail polish sold in the United States contains all three. And all three are known carcinogens. But, let’s not go too crazy with all this awareness . . . The one ingredient Essie does list online is: “dimethicone” which is a “smoothing silicone” substance that can accumulate in the liver and lymph nodes and appears to be linked to the “growth of tumors” (“Cancer Alert: Skin Care Ingredients to Avoid”, by Dr. Edward Group). Sounds awesome, doesn’t it? That, my friends, is pink washing – selling a product that is known to contain chemicals that cause or contribute to breast cancer in the name of breast cancer awareness. We need research. We need to learn what causes breast cancer. We need to educate. We need more RESEARCH. We really don’t need: pink portapotties, pink golf carts or Mike’s Hard “pink” Lemonade or make-me-aware-pink-potentially-cancer-causing-nail-polish with cute (sic) names. We don’t need more awareness. I dislike the pink onslaught and pink hoopla because it celebrates something that truly is not happening. We aren’t curing breast cancer with pink balloons and pink products. This “awareness” isn’t getting us anywhere. Sometimes I wonder if we are even treading water. My friends, your friends, are still getting diagnosed, still going through chemo, still dying, period. It is just so damn tiring. Why don’t we just all admit it – this cure thing is a fiction at this point. We are no closer to a cure now than we were when my Aunt died of metastatic breast cancer in 1994. But, one thing is for sure – the pink profiteers are profiting big time – all in the name of breast cancer awareness. For me, my personal breast cancer awareness is about the daily physical and emotional ramifications I still deal with nearly six years out. For me, breast cancer awareness is about my friends who have died, who will die and who will be diagnosed. For me breast cancer awareness is about how difficult it still is sometimes to simply live my life. For me breast cancer awareness is the guilt I feel in saying that very thing – that it is “difficult” being a “survivor.” After all, don’t I realize how lucky I am to be alive six years out? Of course I do. But, knowing how amazingly lucky I am does not mean that I don’t also feel like crap some or even a lot of the time. Pain and lymphedema are frequent visitors post cancer treatment. On the upside, I’ve learned to shrug off pains now without too much thought of it being a recurrence. That is some real progress. But, I continue to see my friends get diagnosed. Many friends have had recurrences. And so for me, not thinking about a recurrence is something I have to actively work at, especially when I am seemingly surrounded by all of this pink crap during October. So for the rest of this month of breast cancer awareness I am going to try to be less aware of the pink and try to see the orange and black halloween decorations and the fall colors displayed in the grocery stores (let’s face it, living in Southern California, that is about as close as I get to seeing “fall colors”) and try not to see too much of the sea of pink. And, I will try not to retort back with something snarky to the well meaning grocery store clerks when they ask me if I want to “donate to breast cancer” (whatever the %@&# that means). I have always been tempted to respond with something like this: “No thank you, I’ve already donated my breasts to breast cancer. I think that is enough” . . .
← So glad to be on this side of things . . . YES nothing new, nothing has changed-I get very down about that. Sigh. I know. It gets me down too. I hope I haven’t contributed to that in any way. Sometimes that is why I don’t bother with writing. And, given that all of it just makes me hopping mad, I have a hard time writing anything cohesive at all about it anymore. So tired of all of the pink and no progress. I just went on this exact rant in my staff room the other day. Because the mushrooms I bought at the supermarket were adorned with the pink ribbon. And yes. I almost shamed a clerk by answering that same frustrating question ‘would you like to contribute to breast cancer’ today the same way. It was close. Pink Ribbon Inc. is a good watch if you’re interested. On Netflix from what I understand. Thank you for your comment 🙂 Wow, pink ribboned mushrooms? And now Komen is pinkwashing fracking apparently . . . unbelievable! I can’t wait for the pink part of October to be over. Ugh, ugh, ugh! Lisa!! It’s been ages!! Like you, I’m six years from diagnosis, was finishing radiation during October six years ago, of all the stinking months to be getting treatment. Then, onto tamoxifen. Oy. No, too little has changed. If anything, the pink absurdity gets even more absurd every year. And I’ve been getting more bloody emails trying to get me to endorse something, a product, a book, a website, a Facebook page, some disguised as offering me ‘recognition for promoting breast cancer awareness via social media.’ What a crock. It’s really good to see you still here & blogging. I took a lot of time off this year, in an attempt to try to get my house to look like a regular person lived in it, and not a person suffering from long-term cancer treatment side effects. That hasn’t changed much either, sorry to say. Awe, Kathi! I am only just now seeing your comment here! So glad I am finally seeing it lol As you know, things have been a little crazy…sigh. I bet you get a lot of emails asking you to endorse something, good Lord. I had not even thought of that. You probably get inundated. I only get stalked by Komen’s “marketing” staff and asked to reconsider my opinion of them HAHAHAHAHAHA!! !